SUMMARY: Arachnoid granulations may expand the dural sinuses or inner table of the skull. Although usually incidental, giant arachnoid granulations that are of sufficient size to fill the lumen of a dural sinus and cause local dilation or filling defects can rarely cause symptoms due to sinus obstruction leading to venous hypertension. This 31-year-old man presented with a 3-month history of progressive bifrontal headaches and a giant arachnoid granulation at the posterior superior sagittal sinus. Intrasinus pressure measurements showed no significant pressure difference across the lesion to explain the headaches, which were then treated medically. Dural sinus pressure measurement, in certain cases of giant arachnoid granulations, can be used to exclude the lesion as the cause of the patient’s symptoms. Arachnoid granulations are growths of arachnoid membrane into the dural sinuses through which CSF enters the venous system.1 They normally measure a few millimeters but may grow to fill and dilate the dural sinuses or expand the inner table of the skull.1–3 They are often discovered as incidental findings in the transverse and posterior superior sagittal sinus,1–3 though they have rarely been reported to cause symptoms from venous hypertension secondary to partial sinus occlusion.2 We present a case of a patient who presented with progressive headaches and a giant arachnoid granulation involving his posterior superior sagittal sinus. Intrasinus pressure measurements across the lesion were performed to exclude the lesion as the cause of the patient’s symptoms. A 31-year-old man presented with a 3-month history of progressive bifrontal headaches. Neurologic examination revealed normal visual fields and acuity. Funduscopic examination showed sharp disk margins. Imaging studies including CT, MR imaging, and CT angiography were performed. Findings demonstrated a giant arachnoid granulation in the posterior third of the superior sagittal sinus, expanding the surrounding inner table (Fig 1A, -B). Lumbar puncture was performed, demonstrating clear CSF with no pleocytosis. Opening pressure was high normal. Because of the possibility of relative venous obstruction producing venous hypertension and headaches, cerebral angiography was performed. The venous phase of the angiogram revealed an enlarged superior sagittal sinus involving the posterior third of the sinus, with an apparent filling defect dividing into 3 separate channels that flowed around the filling defect and reconstituted distally (Fig 2A). Intrasinus pressure measurements showed no evidence of significant pressure difference across the lesion within all 3 dural venous limbs to account for the patient’s symptoms (Fig 2B). The headaches were treated symptomatically with medical therapy. 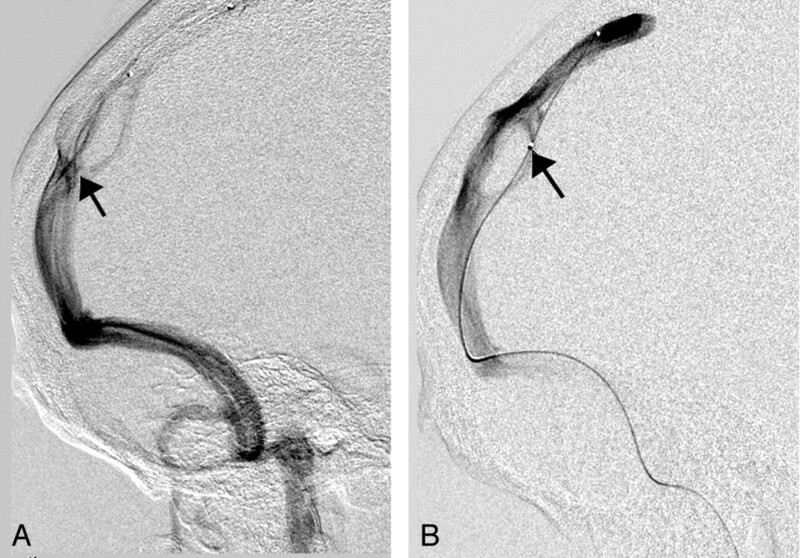 Axial (A) and sagittal (B) CT angiograms show a giant arachnoid granulation in the posterior superior sagittal sinus (arrow). In B, the expansion of the inner skull table is visible. A, Angiogram shows the superior sagittal sinus (arrow) dividing into 3 separate channels that flow around the filling defect and reconstitute distally. B, Angiogram of the superior sagittal sinus shows a microcatheter (arrow) traversing through the right venous channel to measure pressure across the lesion within the right venous channel. Arachnoid granulations or villi are growths of arachnoid membrane into the dural sinuses, through which the CSF enters the venous system from the subarachnoid space.1 Arachnoid villi are microscopic, whereas arachnoid granulations represent distended villi and are visible to the naked eye.4 Arachnoid granulations increase in numbers and enlarge with age in response to increased CSF pressure from the subarachnoid space and are usually quite apparent by 4 years of age.5,6 They normally measure a few millimeters but may grow to expand the inner table of the skull, most commonly around midline in the posterior frontal or anterior parietal area.7 Occasionally, they even expand into the diploic space and eventually involve the outer table, mimicking osteolytic lesions.6–8 Although there is no consensus in the literature, we refer to arachnoid granulations as “giant” when they are of sufficient size to fill the lumen of a dural sinus and cause local dilation or filling defects. Although they are often discovered as incidental findings in the transverse and posterior superior sagittal sinus,1–3 they can grow to fill and dilate the dural sinuses, causing symptoms of increased intracranial pressure from venous hypertension secondary to partial sinus occlusion.2 In our patient, the lesion appeared to impinge on the posterior third of the superior sagittal sinus. To determine whether the lesion was causing venous outflow obstruction and venous hypertension, we performed intrasinus pressure measurements across the lesion through each dural channel. In patients with pseudotumor with venous sinus obstruction as the cause of increased intracranial pressure, the proximal venous pressure was found to be as high as 36 mm Hg, with a corresponding pressure gradient of 25 mm Hg.9 The presence of normal venous pressures (∼15 mm Hg) and the lack of significant differential pressure across the lesion within all dural venous limbs (<5 mm Hg) in our patient ruled out venous hypertension and excluded the lesion as the cause of the patient’s symptoms. Imaging of giant arachnoid granulations is often suggestive of partial sinus occlusion. Although largely incidental, giant arachnoid granulations can rarely cause symptoms due to sinus obstruction leading to venous hypertension. Dural sinus pressure measurement across the lesion is a novel and valuable approach to determine if the lesion is symptomatic because of venous obstruction and hypertension. Normal venous pressure with no significant differential pressure across the lesion can safely exclude the lesion as the cause of the patient’s symptoms. We thank Kristin Kraus for her editorial assistance in preparing this manuscript. Accepted after revision August 21, 2005. "Giant" Arachnoid Granulations Just Like CSF? : NOT! !